Hi loves! Recently I received 4 complimentary mini's from Femme Fatale Cosmetics, provided for review. Today I have the first 2 for you, the other 2 are waiting to be edited and posted ;-). I must say I was very impressed in the way the review package was put together. Sometimes it can be difficult to determine what a brand wants you to include or mention in your review, or if there are any expectations when the review should be due. Femme Fatale Cosmetics nicely added an information sheet, with everything I had to know to do my review! This might not be interesting if you aren't a blogger, but I can only assume the take as much care of their regular orders and that must mean good customer service! Now, about the lacquers. 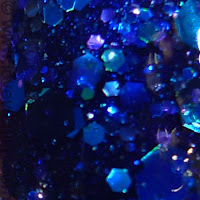 Today I am showing you 2 out of 4, I chose to show the layered glitters first. Application wasn't bad but not easy either - these are STUFFED with glitter so some dabbing and placing is needed to get a nice result. 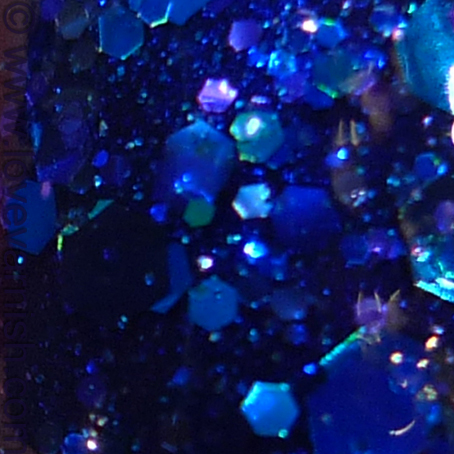 They did dry quite smooth for glitters like these, but still need a coat of something like Gelous before your regular topcoat. Let's start with Coldwraith. 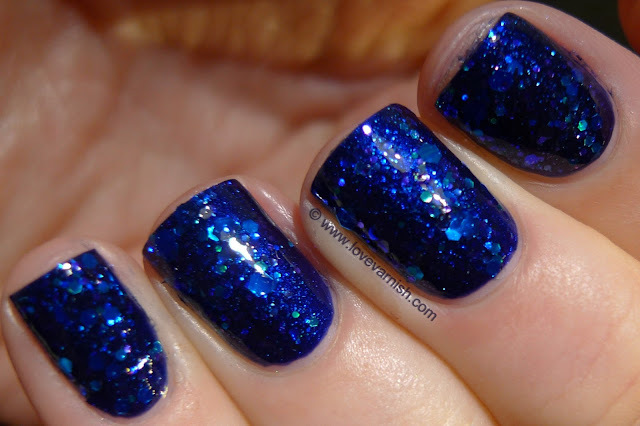 This is described as: a dense blue glitterfest in a deep blue base, with hints of teal holo and flashes of purple. Totally accurate! 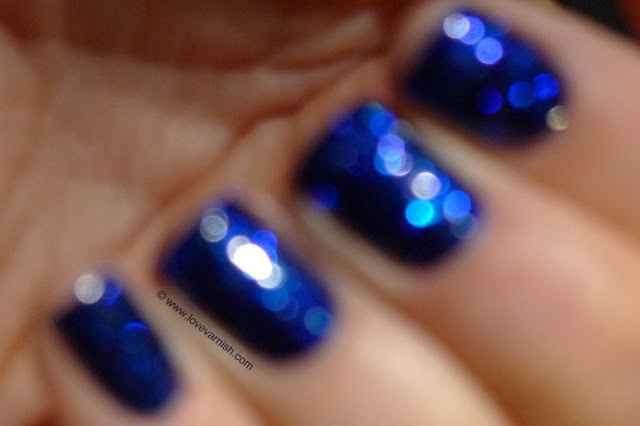 I layered 1 coat of this beauty over Essence Show Your Feet Deep Blue Sea (a dark blue shimmer) and they combined gorgeously. 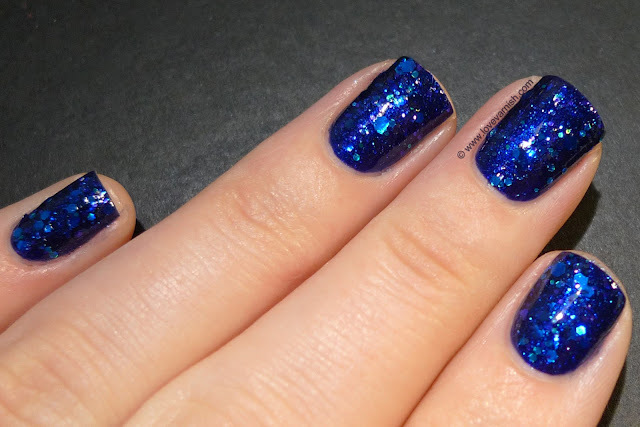 This one applied a little bit better than the second polish I am showing you today, it spread out nicely, I just had to make sure there wasn't any piling glitter. The second polish I am showing you today is Dream Bough. What is a bough? Because I have no idea haha. This is described as: a sheer bruise-purple base with green shimmers, various green/teal hexes, iridescence and a scattering of lavender. Again, very accurate! 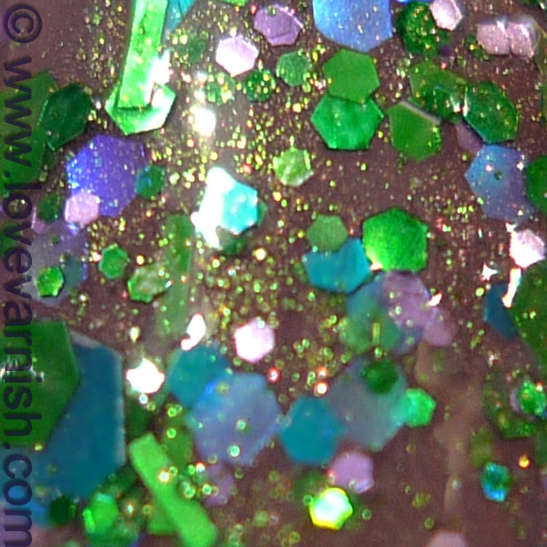 I must admit I was a bit afraid of this polish - the sheer purple base combined with the green glitter (including bar glitter) left me a bit puzzled on how to combine this one. Then I decided the best thing would be to go with the base of the polish. I grabbed Models Own Purple Grey and layered Dream Bough on top of that (1 coat). Quite a nice match I must say! The green shimmer is gorgeous, and I was surprised how cute they green looked against the base. This applied a bit more tricky, it seemed thicker and didn't spread as easy so I had to be very careful in spreading the glitter. Have you seen anything you like? And have you ever tried Femme Fatale Cosmetics? If you are interested in trying them after this review, you can purchase them through www.femmefatalecosmetics.com.au, a full size bottle costs $9,85 and they offer worldwide shipping! These are really nice glitters! Femme Fatale's another big lemming of mine! It is a beaaaautiful one if you love blue like you do! Oh wow, ik geloof dat ik mijn portemonnee al pijn voel doen. Ik kan niet wachten om de andere twee te zien! Haha zeg maar sorry tegen je portomonnee van mij ;)! Aaaah kijk, weer wat geleerd. Thanks!